Commanders in chief are supposed to know a fundamental truth about sitting atop a large and complex military chain of command. They are allowed to take some of the credit for success, but they also must take responsibility when missions don’t go according to plan. Donald J. Trump signed off on a mission to kill or capture some top al-Qaeda leaders, to collect some intelligence on the terror network and, presumably, to return all the men assigned to carry out the mission back home. The mission that occurred in Yemen in late January. A Navy SEAL, Chief Petty Officer William “Ryan” Owens died in the fire fight. A state-of-the-art Osprey V-22 tiltrotor aircraft was lost. Some al-Qaeda leaders died in the battle. So did some civilians, including at least one child. Military and national security officials are still trying to assess the value of the intelligence collected. We keep hearing conflicting assessments. The president, of course, says it is of high value. But the current commander in chief has done something that is quite extraordinary — and inexcusable. He is laying the blame for Petty Officer Owens’ death on the military planners. “They” lost the SEAL, Trump has said. Wait a flippin’ minute, Mr. President! The buck is supposed to stop at your desk. One of your predecessors, President Truman, famously posted the sign on his Oval Office desk that said “The Buck Stops Here.” President Kennedy once declared that “victory has a thousand fathers, while defeat is an orphan” after the failed Bay of Pigs operation shortly after he became president. Trump’s response? He has declared that the planning for the Yemen raid was done by President Obama’s national security team. They crafted the plan that failed, Trump has implied. It’s their fault, too! This is not what commanders in chief do. Under any other circumstance, presidents stand up and take the heat when things go badly. They do not blame others — namely the military brass or their predecessors. JFK’s failed mission in Cuba was actually conceived by his predecessor, President Eisenhower, but the new guy took the hickey, accepted full responsibility for the mission’s failure. A military man who just a few years later would become commander in chief himself, devised a strategy to liberate Europe from Nazi Germany. Army Gen. Dwight Eisenhower — supreme commander of Allied Forces — launched the D-Day invasion of Normandy, France in June 1944. The mission succeeded, Europe would be liberated. But Ike had written an alternative announcement he would have read over the radio had the mission failed. In the message that was never broadcast, he took full responsibility for its failure. I am not going to wander into the muck over whether the Yemen raid was a success or failure. The president’s assertion that the generals were to blame for the death of a brave young SEAL suggests to me that he has doubts about the mission’s overall success. Whatever the case, the event occurred on the commander in chief’s watch and it is that person — no one else — who should be held fully accountable. Here is some news that is going to cheer up the good folks assembling a state-of-the-art airship next door to Amarillo’s international airport. A law student and former Marine who’s studied the bird says the V-22 Osprey is good ship. It’s shown some weakness, some vulnerability and certainly been through some controversy, but it is superior to the aircraft it was designed to “displace,” the CH-46 twin-rotor helicopter. It flies much faster and delivers troops and supplies in far less time. The V-22 has had a rocky ride to be sure. You’ll recall the ship that crashed in Arizona, killing 19 Marines on board. Development and assembly was stopped in Amarillo. Critics began yammering about how dangerous the bird could be to fly. The Marine Corps and Bell/Textron engineers fixed what was wrong and the aircraft has performed well on the battlefields in Iraq and Afghanistan. Every leading-edge aircraft has gone through difficulty. The V-22 is really no different in that regard. Its bugs have been troublesome and, yes, have produced some tragic consequences. I ask, though, isn’t that the norm when introducing aircraft with technology never before used? The Osprey isn’t perfect, as the essay attached to this blog notes. It still costs a lot of money to manufacture and its capabilities have limits. But it plays a key role in our nation’s defense and our neighbors at the assembly plant in Amarillo deserve high praise for the role they play in that effort. Watching the “60 Minutes” report on Sunday about the F-35 fighter being developed by Lockheed-Martin reminded me of a somewhat similar issue close to home. The report dealt with the difficulties that the contractor is having getting the aircraft ready for deployment. The F-35 is supposed to replace virtually all tactical fighter aircraft used by the Air Force, Navy and Marine Corps. The Air Force version is being developed for landing strip takeoffs and landings; the Navy version will be launched by catapult off aircraft carriers; the Marine Corps version will be a vertical takeoff and landing bird. It’s years behind schedule and more than $150 billion over budget. 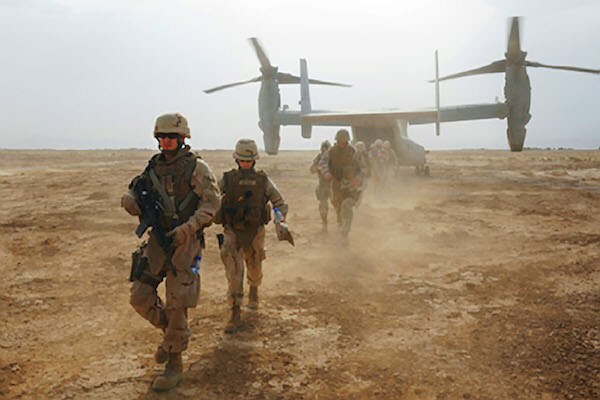 I couldn’t help but think of the troubles that accompanied the development of the V-22 Osprey, the state-of-the-art tiltrotor aircraft that’s being assembled in Amarillo and deployed in combat zones in Afghanistan; the Osprey also saw duty in Iraq. Bell/Textron built the assembly plant here in the late 1990s, it hired a skilled work force and began assembling the aircraft. It met with difficulty. It crashed on occasion — and in one horrific accident, it crashed with 19 Marines on board, all of whom were killed. The Marine Corps grounded the aircraft and began examining what went so horribly wrong. It turned out to be an issue with the rotor, which lifts the aircraft off the ground like a helicopter and then rotates forward to fly the bird like a conventional fixed-wing airplane. Engineers resolved the issue and the Osprey has been performing well on the battlefield. When the tragedy occurred, then-Amarillo Mayor Kel Seliger noted that all state-of-the-art, leading-edge aircraft have endured problems, controversy, glitches in design and performance. The loss of so many lives in one horrific accident, of course, made the Osprey a larger target than usual. All this to suggest that it is my hope they fix what’s ailing the F-35 and that it gets into the air. Pilots from all the services set to use the airplane say it will outperform any fighter in use by any nation in the world and will be superior to the super jets being developed by Russia and China. If only the costs weren’t so overbearing. U.S. Rep. Mac Thornberry is in line to become chairman of one of the House of Representatives’s most powerful committees. There’s a possible conundrum in the works, maybe, potentially … whatever. Thornberry is vice chair of the House Armed Services Committee. The chairman, Buck McKeon, R-Calif., is planning on retiring and he wants Thornberry, R-Clarendon, to take over the chairmanship. It means a good bit of influence is coming to the Panhandle. A committee chairman can steer legislation favorable to his or her district, yes? Thornberry’s 13th Congressional District is home to, oh, the Bell aircraft assembly plant in Amarillo, the one that puts together those V-22 Osprey tiltrotor airplanes. It also services and refurbishes helicopters for the Marine Corps, the Air Force and the Army. Bell’s operation means a great deal to the region. Would a new chairman work extra hard to protect those interests? Or … would he hold to the principle of staying away from what’s been called “pork-barrel politics,” which has been a hallmark of Thornberry’s congressional career. He’s served in Congress since 1995. He is running for yet another term and faces two GOP primary challengers this March and a Democratic challenger this fall. I’m guessing the incumbent is going to use — in some vague or perhaps overt way — the possibility of a House Armed Services Committee chairmanship as a selling point. It would be good for the district. Does doing what’s good for the district mean more money coming this way? Is that pork-barrel politics? That big aircraft assembly plant next to Rick Husband Amarillo International Airport has a new gig. The MV-22 Osprey tiltrotor aircraft being assembled out there is now being assigned to carry key White House personnel as part of the Marine Corps presidential security detail. Maybe one day, the cutting-edge birds will be hauling the president himself (or herself) to and from the White House. The Osprey has come a long way from its formative years when Bell Helicopter returned to Amarillo in 1999 thanks to a grant awarded by the Amarillo Economic Development Corporation. The plane, which lifts off like a helicopter and then flies like a conventional fixed-wing aircraft, has had its fits and starts — and its share of tragedy. It has crashed with Marines aboard, killing 19 of them once on a training mission in Arizona. The Marine Corps and Bell engineers fixed what was wrong with the bird and put it back into the air. Mechanical difficulties have grounded the Osprey on other occasions. The Pentagon stayed with it, lobbying Congress to keep funding the program. It’s been deployed to Iraq and Afghanistan, where it has ferried troops and supplies to and from the battlefield. Now, according to Politico, the Osprey has been used to fly White House support staff and equipment to Martha’s Vineyard, where President Obama has been vacationing with his family. Any kind of state-of-the-art aircraft is going to have trouble. That’s been the history of U.S. aviation. 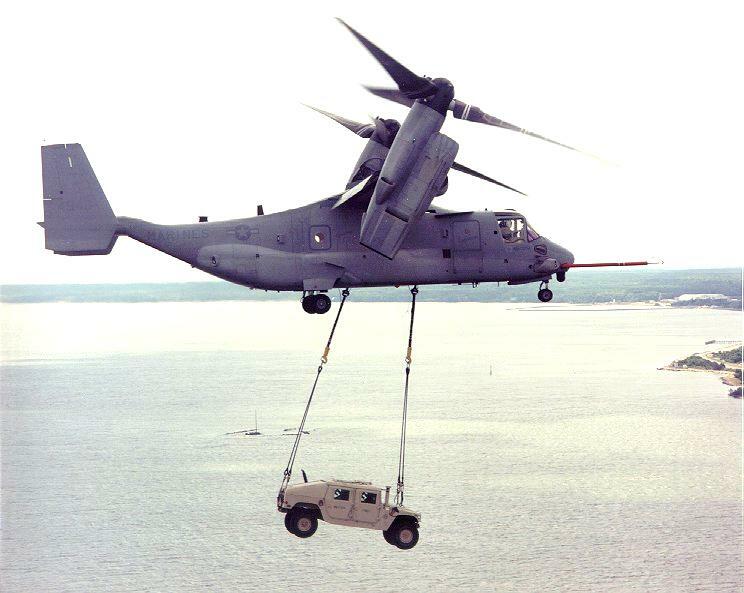 The Osprey in that context is no different from other aircraft. The bird that’s being built in Amarillo is earning its wings with an important new mission.